Orson Welles and the brilliant cast and crew of Citizen Kane (1941) forever changed American film. Today, I'll make the case for why Citizen Kane was influential on the film noir genre that became so popular in the 1940s and 1950s. Citizen Kane certainly isn't a standard film noir. There's no hard-boiled private eyes or gun-toting dames, and the central mystery involves the bittersweet memories of an old man for his childhood sled. Instead, Citizen Kane is a noir in style and tone, featuring storytelling devices and camera techniques that would heavily influence the genre. There were a smattering of true films noir in the early 1940s (Stranger on the Third Floor, The Maltese Falcon), but the genre didn't take off until later in the decade with the release of classics like Double Indemnity (1944) and Laura (1944). Noir filmmakers took their inspiration from many sources, including the horror and gangster movies that were so popular in the 1930s. Citizen Kane's plot isn't anything like other films noir: It's basically a standard biopic about a newspaper tycoon that has been gussied up with arty camera angles and flashy editing, but the collaboration between director Orson Welles, screenwriter Herman Mankiewicz, and cinematographer Gregg Toland opened the door for a new style of filmmaking that changed American cinema. Voice-over narration: A hallmark of films noir is the use of narrator to tell the film's story a la Walter Neff (Fred MacMurray) narrating his sad, sordid tale into a dictaphone in Double Indemnity. Kane isn't the first film to use voice overs -- it was a popular technique since the beginning of the sound era -- but Welles uses it more extensively than other movies, and he uses multiple narrators. Here's Everett Sloane as Kane's business manager narrating his part of the story. Flashbacks: Most films noir use some form of flashback. The most extreme example is Sunset Boulevard (1950) where poor Joe Gillis (William Holden) narrates the story of his demise from beyond the grave. Citizen Kane is of course one long flashback. It begins with Kane's death followed by newsreel footage outlining Kane's life (clip below). A reporter (William Alland) then goes on a quest to fill in the missing details of Kane's story. Central mystery: Most films noir offer a mystery at the beginning of the film that isn't solved until the final reel. For example, Where's Laura? or why is Brigid O'Shaugnessy so desperate to get her hands on the Maltese falcon? Citizen Kane, of course, has Kane's final words, Rosebud (clip below). No one seems to know the meaning of this cryptic phrase, and the audience doesn't find out until the credits roll. Chiaroscuro: Most films noir are black and white movies made in a distinctive style called chiaroscuro, an Italian term that means a sharp contrast between light and dark. Toland was the master of this type of lighting -- you can see it in many of his earlier films like Wuthering Heights (1939) -- but Citizen Kane is his undeniable masterpiece. There are many chiaroscuro techniques in the clip below, including faces obscured in shadows and night scenes illuminated by lightning. Mirrors: Many films noir used the technique of filming through a mirror to enhance the visual style of a movie. 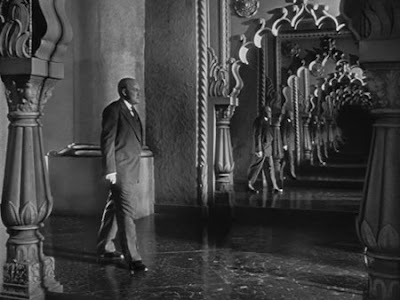 Toland and Welles did this on a grand scale in Citizen Kane with a shot of the aging billionaire walking through the corridors of his palatial estate Xanadu, while being reflected in dozens of mirrors. Mirrors became a common device in films noir with Philip Marlowe (Robert Montgomery) only seen through mirrors in Lady in the Lake (1947). Welles himself orchestrated the famous hall of mirrors sequence in The Lady from Shanghai (1948). Tilted Camera Angles: The Dutch tilt or Dutch angle is a camera that is placed so that the central image is askew. Dutch angles were widely used in the German expressionist films of the 1930s, and Toland and Welles use them a few places in Citizen Kane, for example, to show the alienation between Kane and his wife (Ruth Warrick) and son (Sonny Bupp). Directors picked up on this in a big way. Carol Reed used so many Dutch angles in The Third Man (1950) that the crew jokingly presented the director with a level.